A medical penlight is a portable handheld lighting device that is used in the medical field by doctors, nurses and paramedics. 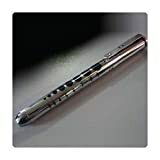 A medical penlight is aimed at facilitating the performance of routine examination of certain areas of the human body that require extra illumination – the eyes, the throat, the nice and the ears (Source). Any medical professional needs a reliable penlight. It should be bright enough to give the medic a clear insight into the examined area, but not so bright that it blinds the patient. It should also be durable, yet portable, and, of course, it must be affordable. If you are looking for a new medical penlight, start your search here with our list of the top five medical penlights. 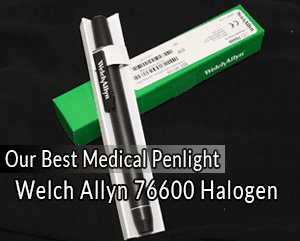 This medical penlight by Welch Allyn is one of the best on the market. With its bright, white halogen light and solid brass body, it is sure to not only be effective but to last years, which means you no longer need to replace your penlight every week, or resign yourself to using poorly-made, cheap products. Because of this model’s durable and solid brass construction, some users may find it a bit too heavy, but the extra effort they will make to work with it is well worth. As medical staff are often on the go, their penlights often drop out of their pockets onto the solid hospital floor and whereupon they often become useless. Wench Allyn’s 76700 model is designed to survive such occasional drops and bumps and keep working as if nothing has happened. It is a reliable helper of any physician, and it is also perfect for minor surgeries. Welch Allyn guarantees their PenLite, with the exception of lamps and batteries, against all manufacturing defects. The company will repair or replace free of charge any parts of its own manufacture proven to be defective through causes other than misuse, neglect, damage in shipment or normal wear. This penlight is not to be used for transillumination as burns could result. The use of this instrument in the presence of flammable anesthetics is strictly forbidden. Penlights are not toys! Keep out of the reach of children! The design of the on-off switch is fantastic. You can be sure that this penlight will never turn on accidentally. Because you need to pull the switch to turn the penlight on, anyone that borrows it will probably be confused and not ask to borrow it again. You can activate it one-handedly, which is critical when your other hand is managing the patient’s eyelids. Although the light is slightly uneven, a product of the antique halogen bulb (you can see the reflection of the filament coils) the color is good and true, and it is bright enough to elicit a pupil response in the most patients. The model is powered by a pair of AAA batteries that are readily available. This model features stealth black finish and 180-lumen, cool white, second-generation LED light. It is made of aircraft grade aluminum alloy and stainless steel. Its Impact-resistant glass lens with dual-coating, sapphire coating on the outside and anti-reflective coating on the inside is designed for optimal efficiency and durability. 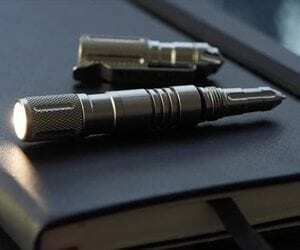 The Preon penlight by Foursevens is powered by two standard AAA batteries. It has three output modes – low, medium and high, which give this penlight a significant advantage over its single-mode rivals. This model also has a memory function that remembers the last setting it was on the last time you used the penlight. This penlight is 5.3 inches long, it weighs 0.8 ounces and measures 0.5 inches in diameter. The compact size of this medical penlight means that its continuous use is less likely to cause fatigue. Our number three contender is not a single device, but rather a pack of six disposable penlights, meaning that when one of them stops working, you just drop it in the nearest receptacle and move on. This solution is perfect for the medical professionals, who are prone to losing their penlights or having them borrowed for good by coworkers. For them, it may not be money-wise to spend a large amount of cash on a penlight, which is why there are cheaper options like this ADC Disposable Diagnostic Penlight. Even though they are disposable, they have an impressive battery life. This is partially due to the difficulty of turning it on accidentally, which saves a lot of energy. 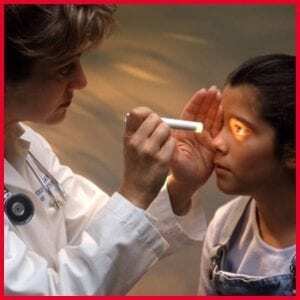 Although these disposable penlights are not as bright as most other models, they are still bright enough for simple eye checkups, and use incandescent light for excellent tissue color rendition. 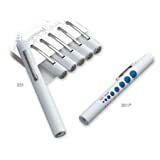 This is a penlight solution that most nurses will find helpful, though medical doctors may find it a bit dim for their specific needs. The 351 series features a sealed concentric beam. The disposable diagnostic penlights are activated by depressing the pocket clip. Each disposable penlight is 5 inches long and measures half an inch in diameter. The six-piece pack is offered only in white and the penlights have no pupil gauge. The penultimate spot on our list is again for a pack of six disposable penlights. This time, they are offered in different color schemes and look quite cute. Each disposable penlight produces sealed concentric beam and has a pinpoint lens to illuminate the eyes, ears, and throat of the patient. The Primacare disposable diagnostic penlight set is easy to use and affordable. Each of the penlights in the pack has a lightweight, molded plastic body and a high-quality, long-lasting and energy-efficient standard bulb. It is fitted with a pocket clip for portability and for activation of the light, and with a pupil gauge, printed on its body. Each penlight is five inches long and measures half an inch in diameter. The manufacturer vows that these penlights will keep working for months or even years and that you’ll find it hard to believe that they’re disposable. 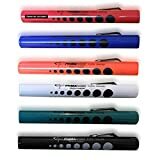 Whether you’re a medical practitioner who wants the color of their medical tools to match that of their uniform, or just someone who wants more color in their life, these colorful quality penlights are perfect for you. The pens come in Red, Blue, Orange, Green, Black, and White. For those looking for a sleeker and more stylish penlight, there is the Patterson Medical High Intensity Penlight. It is 5in long with a 0.5in diameter and its body is chrome-plated. This device runs on two AAA batteries and produces a nice, bright light, but not blindingly bright. This penlight is just perfect the busy medical professional. For extra convenience, it comes with a pupil gauge and measurement tool, making it a great penlight for nurses. A medical penlight should preferably be small in size, so that it easily fits in the medical professional’s pocket. As the medical penlight is an examination tool used almost every day, it should be portable and comfortable to hold. We strongly recommend that you pick up a penlight with an adjustable power option. Usually, these models have three modes of operation – bright, medium and low. Usually, these devices work like this: a full click turns the device on and off; a half-depth click cycles between high, medium, and low output. Then, a full click returns to light intensity level last used. 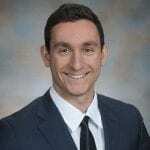 If your job demands that you examine dozens, even hundreds of patients a day, then it is advisable that you buy one of the six-pack solutions discussed above. The penlights in the pack are made of durable plastic and, although their performance is slightly below that of their more expensive rivals, they offer excellent value for your money. On the other hand, if you have a private practice and examine only a few patients a day, then maybe you should pick up a stylish and more presentable model. These models are generally a bit heavier and more expensive, but the quality they offer is second to none. Most of them are made of solid aviation-grade aluminum alloy. Medics can often find themselves in very harsh and even life-threating circumstances. In many cases, the primary tool that gives them a quick grasp of the patient’ current is their medical penlight. So, you need to choose your penlight wisely. Pick up one that you can trust, no matter when and where you need to use it. As Doctors and nurses often need to respond to emergency calls and rush to examine patients on site, their medical penlight should be able to resist rain, dust, cold or hot weather. We encourage you to check if the model you have picked up has some weather resistance before proceeding with the purchase. The lenses of the medical penlights are made of high-quality optical glass and most of them are pre-focused, which greatly facilitates the process of examination. The frequency of the light emitted by your medical pen depends on the design of its lens. All of the products on our list have well-designed lenses and deliver excellent illumination of the examined area. Although many doctors, nurses, or EMTs say they seldom, if ever, need a pupil gauge, we strongly recommend that you choose a medical penlight model that has got one. Some of the medical penlight models reviewed above have a pupil gauge printed on their side. Most, if not all, of the medical penlights available on the market are powered by batteries, but some models aren’t very power-efficient, however stylish they might look. We strongly recommend that you go for a model that has a great light output and at the same time does not consume too much power. If it looks posh – that’s even better! The manufacturers of some disposable penlights brag that the inbuilt batteries of their devices last so long that you will actually forget that you are using a disposable device! All of the models reviewed above are made of top-class materials and their efficiency and user friendliness have been rigorously tested. However, for many nurses and doctors their medical penlight is much more than a simple examination tool. Some medical professionals prefer models that they won’t regret losing or having broken, while others tend to regard their penlight as a symbol of their high status. The medical penlight is definitely something that will be up for further discussion. No matter which group of medics you fall into, you are now armed with tons of useful information to go out and buy the model that you think will work best for you. A big “Thanks” for reading our review and happy shopping!